theTEAMadvantage is proud to announce its joining of Pacific Sotheby’s International Realty, adding a new dimension to the luxury real estate team’s already impressive accomplishments. 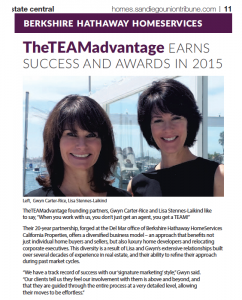 Founded in 1995 by Gwyn Rice and Lisa Stennes, theTEAMadvantage spent 20 years as a top producing team at Berkshire Hathaway HomeServices California Properties serving clients across North County Coastal San Diego. Both founding partners received numerous Berkshire Hathaway HomeServices honors and established themselves as mainstays in the brokerage’s luxury-focused programs. 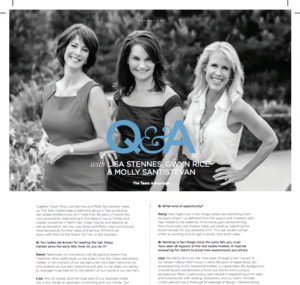 Accompanying Rice and Stennes in the transition are Molly Santistevan, Dana Jones, Hannah Politzer and Michelle Sargent, partners in the team. Pacific Sotheby’s is San Diego County’s premier luxury brokerage, providing comprehensive real estate services and world-class marketing partnerships. True to the acclaimed Sotheby’s International Realty brand, Pacific Sotheby’s takes pride in connecting extraordinary properties with extraordinary lives.